Your gaming experience will be a complete drag without a good gaming keyboard even if you have the best rig or feature-packed mouse. A keyboard is your physical connection to the digital world; it’s the tool you need to give your character life. There’s no room for skimping on quality, make sure you get a keyboard that can withstand the constant mashing and countless hours of gaming. When identifying the best gaming keyboard, research is a must! An understanding of what it is that you’re looking for is crucial, and here’s a few questions most people ask. Is mechanical better than membrane? Do you want a wireless or wired keyboard? Is the keyboard backlit…is it customizable? And, that’s not all; while focusing on what that piece of hardware has to offer now, you also need to check the additional features offered. You and your team may appreciate a keyboard with statistics tracking, touch screen displays, or text and audio communication. How about the ergonomics? Looking at all these considerations, it goes without saying that you have endless possibilities of pairing up your rig and the gaming mouse with the best keyboard possible. With switches, ergonomics, backlighting, and the feel of the keyboard determining usability, which keyboard will you give the title of “The Best Keyboard for Gaming“? The gaming keyboards below are among the best you could ever ask for. Their differences lie in what they can and can’t do, their prices, and the quality of gaming they offer. Why Choose a Mechanical Keyboard (vs. Standard)? How do the keyboards differ in design? The following gaming keyboards are some of the best on the market, each designed to match any gamer possible. Some offer quality on a budget while others over-deliver on features, but each come with its own set of benefits that will cater to a wide range of PC gamers. The USB passthrough saves you from interruptions in the middle of a game. For the ultimate gaming experience, your keyboard should offer supreme performance. With Corsair’s understanding of just how much a non-responsive or a slow peripheral device could cost you a game, they came up with this high-end and responsive keyboard. What features make for the high performance of this keyboard? While membrane keyboards give a smooth and even spongy feel, it doesn’t give you that gaming kick, leaving mechanical keyboards with the win. What makes the Cherry MX Speed RGB switches better than the standard Cherry MX Red Switches is the speed; it’s 40 percent faster than the standard Cherry MX. The 1.2mm mechanical actuation, as well as the durability of the Gold contact Cherry MX switches allows you to unleash the fastest gaming speeds. That’s just the tip of the iceberg – the keyboard grants you to the power to wield the ultimate competitive advantage of your opponents thanks to the light operation 45g key switches and the faster actuation. Media and gaming devices go hand in hand. This keyboard comes with a plethora of media features which assure you of the best gaming performance. The volume wheel mounted at the corner, the mute button at the left, along with the four dedicated media control keys (Stop, Play/Pause, Backward and Forward) will give you ultimate control over all the sounds in the game. You might like the location of the four media control keys – they are under the volume wheel, just above the number pad. You can control your audio without ever interrupting your game. How well-designed is the keyboard you are looking for? The Corsair K70 Rapidfire comes with a forged aluminum display built to withstand any form of storm after the storm you will put up in the upcoming storm of keystrokes. You don’t have to worry about the keys falling out. For an enhanced feel, total control, and a maximum grip, you have the textured and the contoured FPS and MOBA keycap sets. 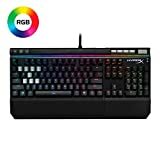 To enhance its ease of use and to boost the performance, the keyboard comes with Corsair Utility Engine (CUE) which enables the sophisticated macros, plus the dramatic lighting effects. The lighting effects not only make this the coolest gaming keyboard but also functions as a navigation tool. If you shriek every time your game gets interrupted because of USB ports that get in the way, or you lost your last games to tired wrists, get ready for a treat. Corsair’s K70 Rapidfire offers uninterrupted gameplay from the USB Pass-through port. The port is also ready for your wireless headset adapter or the mouse. Leveling up sophistication and gaming comfort is the detachable soft-touch wrist rest which will protect your wrists, helping you trump over your opponents. Anti-ghosting (Anti-losing): if you have been looking for a gaming keyboard that allows you to keep up, no matter how fast you are in-game actions, you could take advantage of RAPIDFIRE’s ability to keep up while registering every key press correctly, every time. Wondering how that is possible? Well, it comes with a full key rollover plus 100 percent technology. These will always keep you caught up. A great gaming keyboard looks great and feels exceptional. Not only will the gaming keyboard guarantee the highest level of precision, but it will also offer years of effortless use and wins. So, do you have what it takes to be the greatest gamer? Even with the best gaming rig, are your peripherals up to the task? Razer mechanical switches are known as the new standard for all mechanical keyboards! Life-span: the design of the keyboard is in such a way that it will outlive your gaming habits. How? It gives 80 million keystrokes in its lifetime. And, if the keystrokes break within two years, the 2-year warranty will ensure that you get a replacement. Even so, you don’t have to worry about poor quality design since the manufacturer, Razer manufactures the keyboard in-house, end to end. This ensures that even the strictest design measures and requirements are adhered to. The only thing to worry about is that the keys may wear easily. Lighting and keyboard design: With 16.8 million customizable color options and fully programmable keys consisting of the on-the-fly macro recording, you can expect nothing but the coolest gaming experience. The best part is that you can change the colors of the keyboard using a synapse. Thanks to Synapse, you can sync your unique lighting setting which will range from breathing, spectrum cycling, custom reactive or wave, and preloaded templates. A unified cloud-configurator makes all that possible. The other exciting bit is the keyboard’s pre-loaded lighting effects which work for different games. You also get customize your unique palette of colors, enhancing your gaming experience in your unique way. SDK: if you are a developer looking to take advantage of all the lighting options presented by Razer Chroma, SDK is precisely what you need. It lets you integrate the advanced lighting effects to come up with an in-game lighting alert, as well as actions-per-minute lighting features. Inter-device color synchronization: which is your favorite hue? Do you like one color or you have a whole list of favorites? Well, whatever your color theme the 16.8 million colors available will open your world to impossible color possibilities. With this feature, all your games will work together perfectly. Other than the customized gaming experience, the keyboard come with 5 extra dedicated macro keys, 10-key roll-over anti-ghosting, a braided fiber cable, and 1000Hz ultrapolling. The easy-cable routing comes with a 2.0 USB and an audio pass. These features make for hours of uninterrupted gaming. The mechanical gaming keyboards you come across will differ in terms of the level of actuation and responsiveness they deliver. The Logitech G910 Orion Spark, like the other highly regarded gaming keyboards, offers up to 25% faster actuation thanks to the new Romer-G mechanical switches which allow for the execution of every command as fast and as soon as you press the keys. With the switches and the durable design of the keyboard, you can push the keyboard to over 70 million keystrokes. The Logitech G910 Orion Spark is revolutionizing gaming and the world of RGB gaming keyboards. Its intelligent RGB illumination will let you customize lighting for the individual keys, as well as games. The best part (which could be confusing) is that the keyboard gives you access to about 16.8 million beautiful and brilliant colors. What’s more, the keyboard has pre-loaded lighting profiles for more than 300 games. The colors and different lighting profiles assure you of the most exciting gaming experience. Speaking of great experiences, Logitech G910 Orion Spark has a bespoke mobile display which lets you keep the top critical in-game data. This happens through the keyboards Arx Control App, plus the docking station for your tablet or smartphone. It leaves nothing to chance. Pushing the efficiency of the keyboard further are 9 programmable G-keys. These keys will let you customize your games. You can create as many as 27 custom commands, all across 3 profiles, putting ultra fast maneuvers at your fingertips. The quick-access media controls, Play, Pause, Mute, and the Volume Controls are grouped up for fast access. You may also use the onboard roller bar to adjust the volume or to skip to your favorite scenes, at the touch of a button. The palm-rest will protect your wrists from fatigue and pain and also enhance your performance. Even though you need the right Windows or Mac OS software, internet connection for software download, and 70MB disk storage space, the system setup easy. Lacks an onboard memory for storage of color profiles. Lacks USB port, a macro column, an audio passthrough, and dedicated media keys. The mechanical Razer BlackWidow Chroma is sophisticated offering its unrivaled performance and reliability. But, the price tag is a bit high. In its place, you could buy the Razer Ornata Chroma, a revolutionary, affordable, and easy-to-use gaming keyboard. These features give you n epic typing experience with the tactile point of the keys masking the mushiness of the done, but preserving the cushioned feel felt as you bottom out your keystrokes. Unfortunately, the mecha-membrane keyboards lack that distinct tactile feedback or the fast actuation from the mechanical keyboards, despite the softly cushioned touch. Being a hybrid, it has mecha-membrane keys on this keyboard. Why mecha-membrane? Well, the keys have a soft-cushioned rubber dome which has a crisp and a tactile mechanical click. Pressing the keys forms a depression, and the slider pushes a springy metal leaf against the switch casing, producing an audible click sound. Also, the metal leaf adds some extra resistance. Though not mechanical, the performance is great. The mid-height keycaps custom-designed for faster actuation also ensure that you get all your keystrokes. The mid-height design reduces the time it takes for actions taken to register while allowing your fingers to move freely between every key. The individually backlit keys are powered by the Razer Chroma which comes with 16.8 million color options that are customizable, and ones that offer an immersive gaming experience. The interactive in-game features allow the best gaming experience. Like the BlackWidow Mechanical keyboard, it features a 10-key rollover anti-ghosting that allows for the perfect execution of up to 10 commands at once. As you maneuver traps and destroy your opponents, your wrist will rest comfortably on the leatherette wrist rest. The wrist rest is ergonomically designed magnets for an extended level of comfort. The keyboard’s inter-device synchronization lets you choose your preferable shade or a psychedelic palette which you can synchronize with all your Razer Chroma-enables peripheral devices. Programmable keys and direct access media keys. For the most satisfying gaming experience, you might want to get this CORSAIR K55 RGB Gaming Keyboard which is not only affordable, the best gaming keyboard under 100, but also feature-packed. The 6 programmable macro keys give the most powerful actions, as well as key remaps, plus combos. You can assign any keystroke or even a complex multi-key combo to any of the 6 dedicated macro keys available on the fly, and without the need for additional software. While these programmable controls give you ultimate control over your moves, what wins is the quietness and the responsiveness of the keys. The person next to you can sleep and, your performance will remain high. Our other favorite feature, related to the keys is the multi-key anti-ghosting element that lets all your commands and your simultaneous keystrokes register, just the way you intend them to. The tactile mechanical keys also give you a high actuation. The dynamic three-zone RGB backlighting has at least 10 vivid RGB lighting modes which will let you choose between the immersive lighting effects and the static backlighting. The direct-access and dedicated controls for multimedia and volume will let you adjust your audio settings without interrupting the game. And, that is not all: the Corsair K55 has Windows Key Lock mode in the RGB settings that eliminate distractions – it disables the Windows Key when gaming. Unparalleled comfort comes from the detachable and soft rubber wrist rest – just what you need for the long gaming sessions. And, the collapsible feet located at the bottom of the keyboard will allow for optimal positioning of hands. Nice feel from the metallic plate. The patented Romer-G mechanical switch offers the level of precision you require. Even with the simplicity, the keyboard is nothing short of a pro-grade peripheral for your rig. The mechanical switch’s responsiveness keeps you from missing a move. You might like the keyboard for its durability which comes from the brushed aluminum-magnesium alloy (aluminum-grade) top-case, that also serves as the keyboard’s backbone. For clean and precise lighting through its keycap, the Romer-G switch is purposefully designed. Lighting keeps the keys visible at all times without being distracting for the best late-night gaming sessions. Control over the audio functions and the entire game comes from the full-function keys which let you control the volume; you can skip tracks, mute, play, and pause, toggle lighting, and even enter the game mode, among other functions. To use the controls, you have to use the FN Toggle features available in the Logitech Gaming Software for the configuration of the F keys to perform media commands by default. You will, however, need a downloadable gaming software by Logitech Gaming for the Game Mode and custom macro programming. It has 12 additional keycaps for critical gaming, and you can swap them fast and easily using the included puller that lets you remove the Romer-G keycaps. You might also like the fact that it comes with a 26-key rollover, as well as anti-ghosting keys. The programmable macros will make your gaming life easier. The extra USB cable connects to the USB passthrough port to its input for 100 percent power throughout. The port also offers data speed. The best part is that you can plug in your devices for charging or your mouse as you get ready to challenge your adversaries. The plastic caps wear off too fast. Though expensive, this full-featured HyperX Alloy Elite RGB will dazzle at your play station, helping you drop jaws as you triumph over your opponents effortlessly. Control over the game and your competition lies in your fingertips thanks to the convenient control of media using dedicated media, as well as the quick access lighting buttons. The unique light bar and the dynamic RGB lighting effects will help you stake all your claims on top of the styling and gaming scoreboard. The solid steel frame will stand the test of time, and it will continue working well, even after it heats up. You will also enjoy the Chery MX Mechanical switches which improve your reliability and fast typing action. What’s more; the keyboard is easily customizable using the HyperX NGenuity Software. The software will let you customize the game mode, set up key-specific lighting, and even build macros. The worst feeling from losing a game comes about when the problem results from a fault on your end. Think about it: when was the last time you lost a game because of USB connectivity issues and the cable clutter in the room? Well, you can now sign with relief because this keyboard will allow you to connect devices using a USB 2.0 pass through conveniently. It will end your connectivity issues, and minimize clutter. Other than the dashing radiant lighting bar delivering an unmatched RGB brilliance, the onboard memory allows for customization. While delivering the highest level of performance, HyperX made sure that you have fun safely. For the safety of your hands, the keyboard comes with a detachable wrist rest. Extra comfort comes from the extra-colored and the textured keycaps. Keeping all your keys on points are features like the Game Mode, anti-ghosting function, and the N-Key Rollover. The mechanized keypad and switches make this keyboard unique and account for its exceptional performance. The tactile Cherry MX Brown key switches give the keyboard its high actuation, and you might like the fact that the keypads are almost mute. These low-noise switches contain a tactile bump that gives you a fulfilling feedback every time you press the keys. Why else do you need this mechanical keyboard? Well, mechanical switches are long-lasting (it delivers more than 50 million keystrokes), their feel is consistent, and it is more responsive than the rubber dome keyboards. The price is also low. We found this keyboard to be one of the leading performance-driven gaming keyboards thanks to its full size which delivers fluid and pure gaming experiences. The backlit keyboard keys don’t just look great but also boost your gaming experience. Being customizable, you get to personalize the lighting of every key making it easy to keep tracks of spells and commands. This Logitech keyboard will give you control over the lighting of every key. You may match the keys with your mouse. It also comes with customizable function keys plus a game mode which allows you to customize macros to keys F1 to F12, thanks to the Logitech Gaming Software. The Logitech G610 Orion Brown also features an easy-access media control for play, pause, volume adjustment, mute, and brightness. These control functions give you control over the audio features without interrupting the game. The roller bar included lets you skip to next or adjust the volume in an instant. This CM Storm QuickFire Rapid keyboard comes in small and large design. You also get to choose one out of the five color options – Red, Green, Brown, Blue, or the XT brown keyboard. Other than the option, its simplistic (more standard design and the individual backlighting are the main features that stand out from the keyboard but, there is more. The minimalistic design of this keyboard features a mechanized keyboard which comes fitted with mechanical Cherry MX switches. In many ways, the design of this keyboard mirrors the traditional ten-button numeric pad. The main downside of this keyboard is that it is lacking in features. For example, the keyboard only gives you five-preset layouts. It lacks individual backlighting for keys although you have the option to color the WASD and the Arrow keys individually. The main upside is that you can individually and manually configure the single buttons. You can save the profiles for use later. The Game Mode prevents accidental interruption. You will, however, like the fact that the keyboard has a 32-bit onboard RAM process so that you don’t need any software. The extra keycaps that come bundled with a key puller (for extra customization), the anti-ghosting function, laser-marked keycaps and NKRO in the PS/2 mode enhance the efficiency of the keyboard. The NKRO (N-Key Rollover function in the PS/2 mode allows pressing of multiple keys without conflict in commands. The Cherry MX red switch will deliver a smooth and a quick response, with low resistance, high comfort, and enhanced durability. The removable braided USB cable with a cable routing prevents clutter and interruptions while the compact design without the numpad section gives you extra space for the mouse while allowing comfortable positioning of your shoulders. Why choose this SteelSeries Apex Gaming Keyboard? First, it takes the crown as the best budget gaming keyboard. Secondly, it has a superior design and several features which promise a flawless gaming experience. With this keyboard, you can move strategically, react fast, and customize the performance, and your performance. 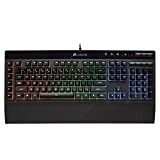 Beyond the option of selecting a few favorite colors out of 16.8 million colors available, the keyboard also comes with a SteelSeries ActiveZone Lighting; as well as a visual support tool that lets you customize each of the 5 zones independently. And, there’s more; the keyboard also contains 8 levels of intensity, all of which you can customize for the macro layers – You also get to add multiple macro layers. The independent media keys, including ones for volume control, give you instant access to your media control. Other than these, the keyboard will also give you the fastest combination of keys. The macro keys placed above the F-keys have a characteristic raised design that lets you locate the keys without having to stumble over all the keys on the keyboard. The design will also help you locate the keys without looking. You can swipe the finger down from the macro key to the F-key for the fast combination. The other exciting feature is the Apex feature which has 22 independent macro keys which allow up to 4 layers. You can make up to 504 programmable keys. And, while in the layers, you can switch between the different macro layers thanks to the 4-key quick access at the keyboard’s upper left corner. It also allows a faster return to WASD thanks to the small bumps located on the W-key. To enhance the keyboard’s ease of use further, you can disable the windows key. It also possesses an anti-ghosting feature that supports 20 keys, and you can press up to 6 keys simultaneously. Serious gamers are aware that the best gaming keyboards, the ones that offer unparalleled gaming experiences have mechanical keyboards. Of course, others still opt for standard keyboards (better known as the membrane keyboards) but, the mechanical keyboards are better. Why? The construction of mechanical gaming keyboards uses higher-quality materials. They have higher accuracy, and speed compared to modern-day rubber-domed standard keyboards. If you are looking for true tactile response, you are better off with a mechanical keyboard. While you can use them for typing at school or work, the mechanical keyboard is considerably loud. Something else to note about the mechanical keyboards is the fact that they are expensive. Though a minor issue if you are serious about gaming your rigs and peripherals. However, if your budget is limited, you may end up with a mecha-membrane keyboard or a membrane keyboard. Unfortunately, the feel is different. The membrane keyboards will only feel right is you are a beginner in gaming or if you need a keyboard for typing. The mechanical keyboards are almost similar to the old typewriters in that they have a mechanical switch placed under every keycap. On the other hand, the standard keyboard has an electrical current that runs through two mushy plastic membranes. With these differences in mind, the mechanical keyboards tend to feel better while offering a higher level of performance and reliability. As a gamer, you should strive to invest in a mechanical rather than a membrane keyboard. Keep in mind that keyboards are available in three different types: all-purpose, MMO, and tenkeyless keyboards. You may also have wired and a best wireless gaming keyboard. Cherry MX Switches. These switches set the standard in the mechanical keyboards; industry. As a result, many non-Cherry MX switches are only imitations. The Cherry MX switches are available in a variety of colors with the most common being red, blue and brown. The colors give the keyboards their characteristic qualities. You will also find Cherry MX Brown and Cherry MX Speed. The red keys are quiet and sensitive to the softest touch. The brown switches are quiet but, resistant, while the blue keys tend to be resistant and loud. Other mechanical, switches include the Greens which are louder and more resistant compared to the Blues or the Blacks which are stiff and shallow. You may also come across Topre switches originating from Japan. Razer switches which are available as Razer Green and Razer Orange. You will also come across the Razer Mecha-Membrane switches. Other include Logitech which developed the Romer-G Switch and SteelSeries QS1. Mechanical And membrane keyboard switches possess structural features too. The mechanical keyboards have a keycap, stem, switch housing, slider, spring, and the metal contact leaves. On the other hand, the rubber-dome (membrane) switches have a keycap, a slider, a silicone membrane layer, and a printed circuit board that has electrical circuits. Gaming keypads are smaller than keyboards, and they have few keys. However, they take gaming to a higher level. The best keypads are the one-hand keypads that translate to fast and convenient gaming. The keypads also offer a higher level of comfort, and they are more functional. The gaming keypads are also better than the keyboards in that; other than the default face buttons you see, they also come with extra utility buttons to boot. However, keyboards and keypads are both available as a membrane or mechanical gaming devices. First, detach the keyboard connector. For membrane keyboards, turn the keyboard upside down and use a can of compressed air to blow out foreign particles. When done, clean the sides of the keys using a cotton swab soaked in isopropyl alcohol. To clean a mechanical and even membrane keyboards, wipe down the surface with a cleaning wipe. You can take apart the keyboard; remove the keycaps, wash them, dump the contents outside and wipe the keyboard with alcohol. Then reassemble the keyboard. You may also use a can of compressed air or an anti-static vacuum. The can of compressed air will blow out foreign matter – turn the keyboard upside down first. Also, check the manufacturer’s warranty and follow the manufacturer’s cleaning instructions. As you make your final decision, keep in mind that the best keyboard for gaming isn’t based on the keyboard itself. Your needs is a factor as well. Do you have the tendency to accidentally hit the wrong buttons during a game? Blue key switches are definitely for you, they take a little more push to activate than red or gray switches. How about lighting? Does your PC and mouse have a theme you’re trying to match? Some keyboards only come with one color where as others offer a wide array of colors. In the end it all comes down to what kind of gamer you are and what it is you want for your gaming experience. If you’re having trouble choosing a gaming keyboard, Corsair K70 Rapidfire is a solid choice. If you want something for a tighter budget, definitely grab the Corsair K55 or the SteelSeries Apex.